Hard pressed for what to say? With ShadowPress Debossing Folders, you'll always have just the right words to create a visual debossed sentiment. 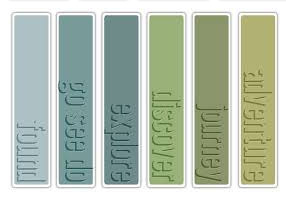 Each impression mimics the look of letterpress designs on cardstock, paper, metallic foil or vellum. Enhance cards, tags and anything else you can imagine with various words from the set. For added visual effects, use inks, markers or other color tools to fill in the negative space of the shadows and make a bolder impression! This set of Debossing Folders showcases the bold and edgy style of Tim Holtz®. It contains six A2 border folders, each measuring 5 3/4" x 1 1/2" x 1/8". ShadowPress Debossing Folders are for use with the Texture Boutique, BIGkick, Big Shot and Vagabond machines only (used with a pair of Cutting Pads and the machine's included Platform). This ShadowPress Debossing Folders Set includes these folder designs: Wonderful (A2 Border); Fabulous (A2 Border); Lucky (A2 Border); Beautiful (A2 Border); Good Times (A2 Border); Hello (A2 Border).